A couple of years ago, it would have been hard to find people with the secret of the real carbonara. As easy as this dish is, many were misled by some dark power destined to ruin all Italian dishes. The same evil power, who created spaghetti Bolognese from the Bolognese sauce, was not at rest when the Western home cooking world were getting introduced to Italian cuisine. It still lurks around spreading misinformation dressed in the cape of fake deliciousness but with the blessing of the Internet, we are aware. 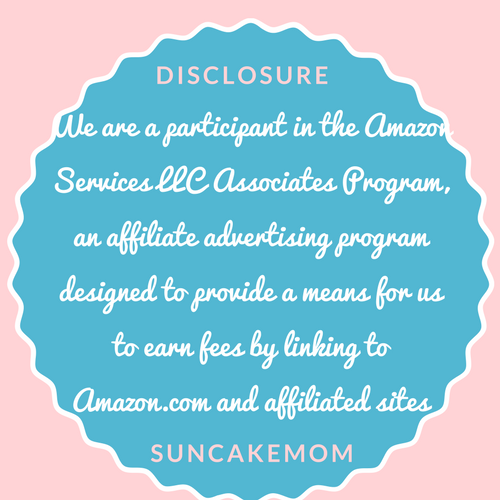 We are armed with information that never was available for home cooks before. It’s hard to even believe that there were times when people had to rely on television shows and adventurous friends to bring light of the unknown into their kitchen. Old recipe books with yellowed paper from grandma or the most recent cookbook from star chefs were the backbone of this society, talking down to its lesser beings sometimes with perfectly looking pictures or worse even without that in obscure language of the kitchen. It was pretty hard time for self-taught newbies getting to know sautéing or the difference between icing or frosting. This recipe starved generation didn’t need much to go astray on their culinary journey. One bad recipe in a book or an experimental celebrity chef was all it needed to burn the magnificence of any traditional dish into ashes for generations to come. 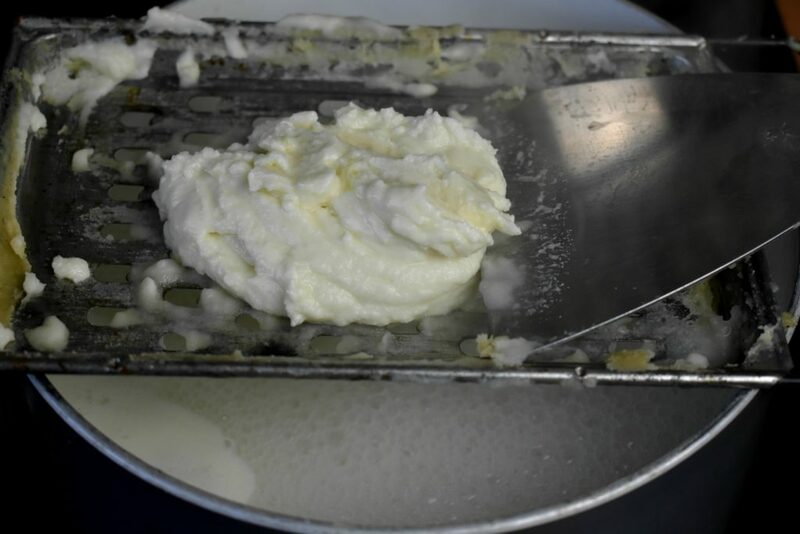 This is how it probably occurred that most of the world outside Italy use cream in traditional Italian dishes that not even a drop is seen in any Italian kitchen. Or at least used at the end of the Pre-Internet era. 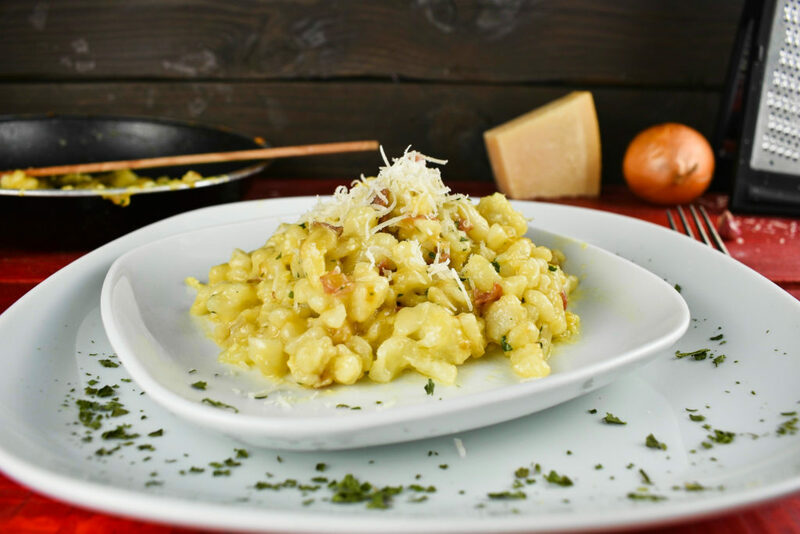 Nowadays, when we look for an Italian recipe online, there are mostly recipes in the search results that try to follow the traditional recipe and highlight any twist to that. How interesting is as we are sailing on uncharted territories of life, like this cyber-world, we are more inclined to keep the known world at our fingertips and carry traditions with us. Actually, this is pure psychology and how our brain is hardwired to prefer safety and the known, but this is another topic entirely. So, thanks for the internet there are fewer and fewer Italian recipes out there that are ruined with cream or anything else which is not meant to enhance the pleasure of eating but to dampen it. Pasta Carbonara is as plain dish as it is delightful. It’s a pity that we experience a surge of gluten sensitivity and various diets that are fretting on pasta in general. Thankfully, there are alternative options like rice pasta for gluten allergy, black bean pasta for keto or spaghetti squash for both. 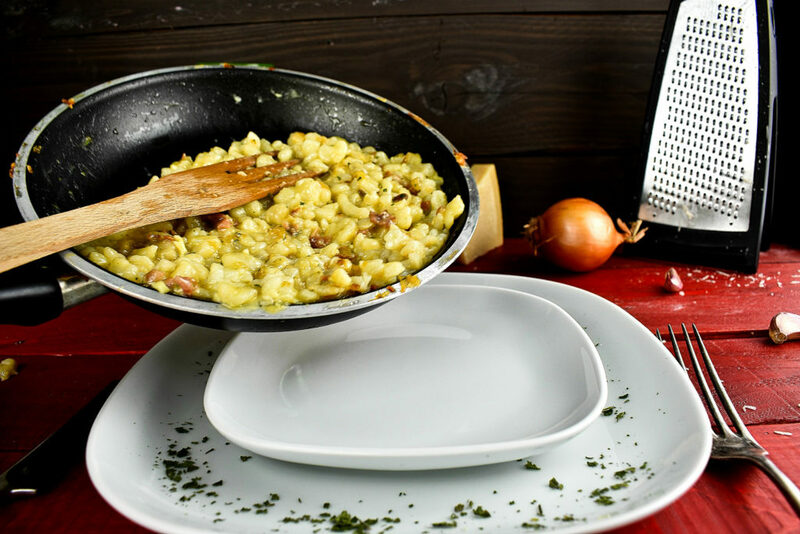 The desirability of the pasta Carbonara lays not only in its deliciousness but in its plainness to prepare it. It needs a bit of technique too but little else apart from that in terms of ingredients or even preparation. 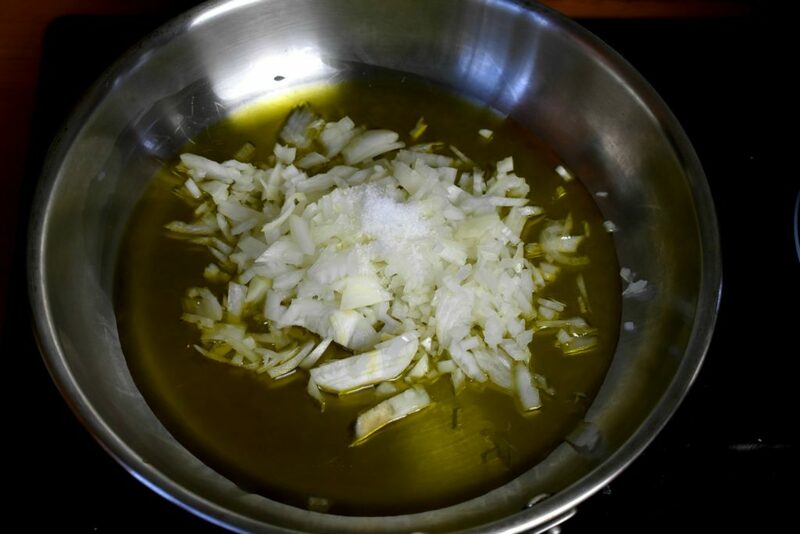 This particular recipe will use some optional slightly caramelized onion to add extra richness to the dish but this step can be skipped entirely if onions are not desired. Although, the best Carbonara pasta is spaghetti or tagliatelle as those shapes are the most suitable to transfer heat and cook the egg, we use a quick homemade fresh pasta here. Fresh pasta is amazingly easy to make even without equipment and pretty useful to know if the realization of low pasta stock hits us at the moment when we turn on the hob to boil the water. With a bit of extra fiddling this noodle type pasta can be made without equipment by cutting the dough into the water by a spoon or knife. It takes a bit more time than with a noodle cutter tool but traditionally it was done like that anyway. 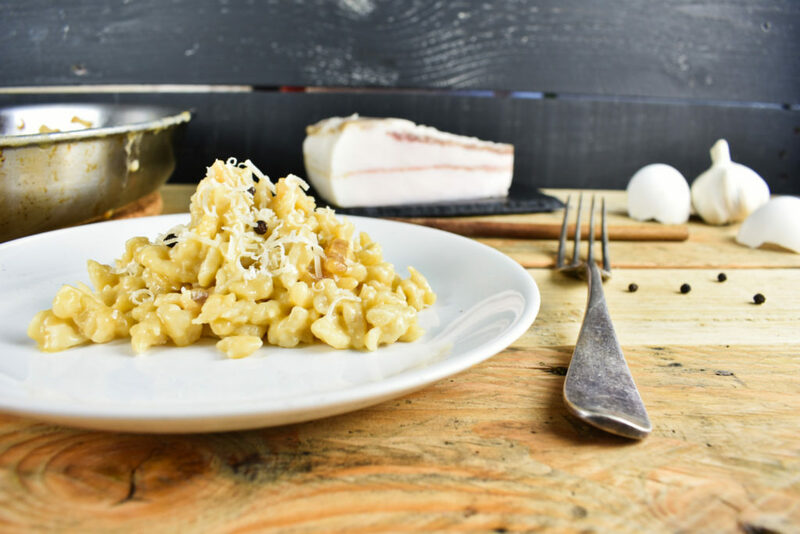 Orginally the Pasta Carbonara calls for Guancale or Pancetta to give flavor to the dish and yield the necessary fat but we can use what we have available on site. 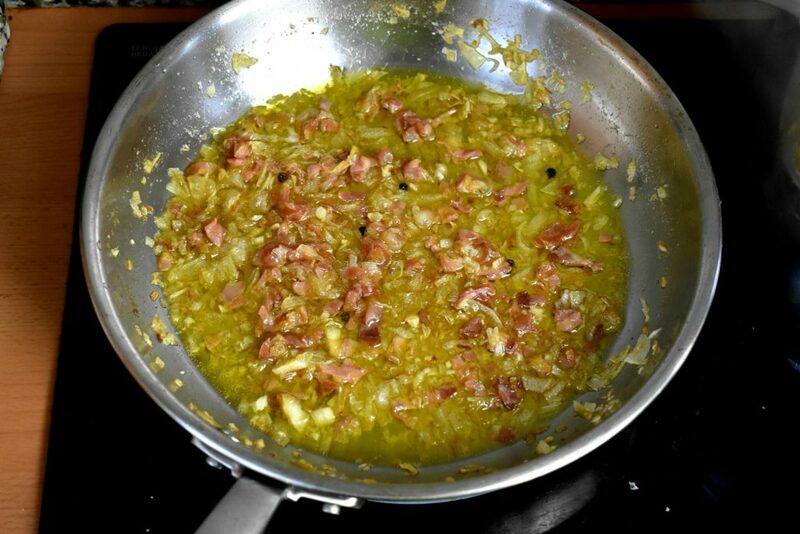 Using bacon for flavor and cooking oil will do the trick just right. Also some chefs prefer to separate the egg white and use the yolk only which isn’t necessary but another option to have. 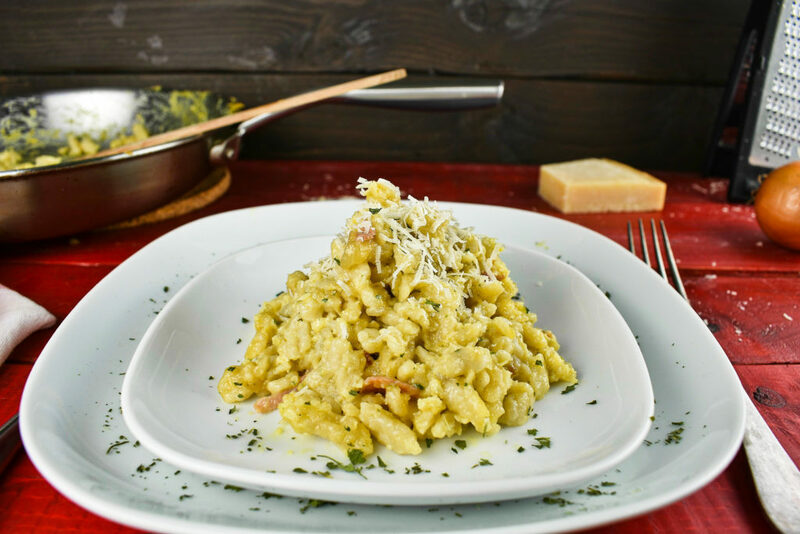 The beauty of pasta Carbonara is that it doesn’t matter what type of pasta we use be it gluten free, keto or paleo, the result will be all the same. 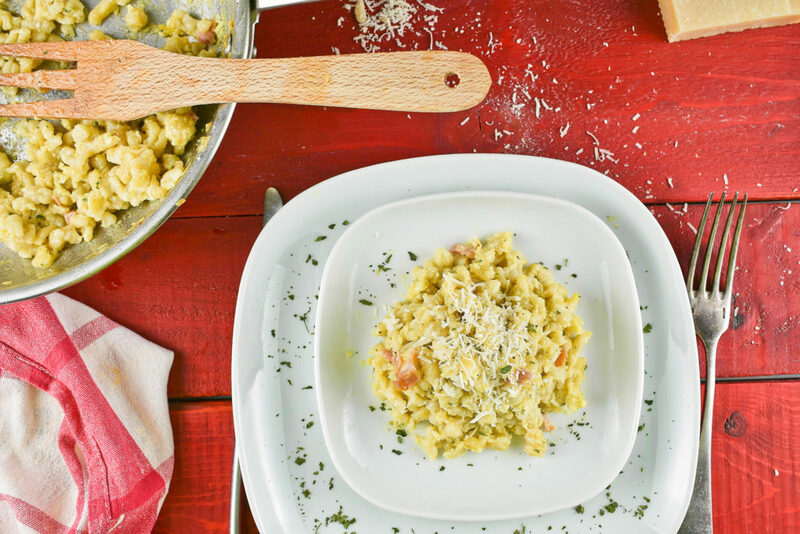 A deliciously creamy dish with exciting flavors straight from the heart of Italy. Saute the onion on high heat for 5 minutes until it gets a glassy, translucent look then add the bacon, garlic and black pepper. 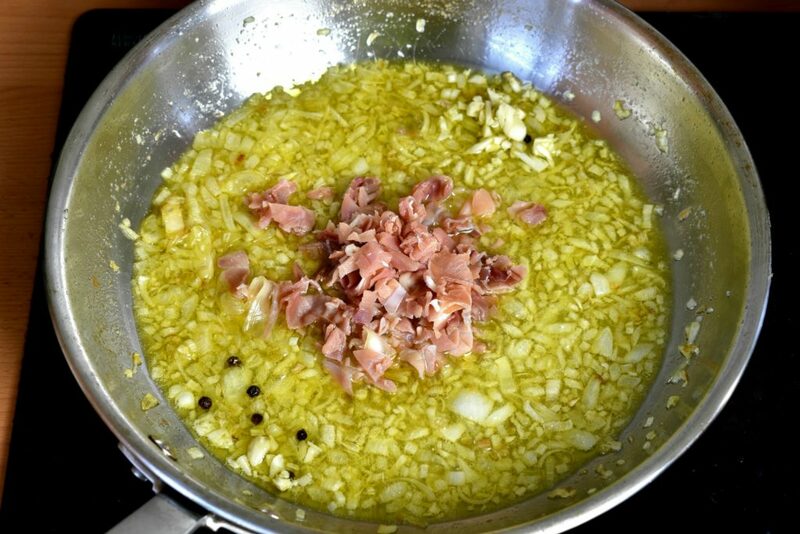 If we cook with Pancetta or Guancale the process needs to be started with rendering the fat out of the meat and adding the onion after when there is enough fat to saute it. Also the fried bits of meat needs to be taken out while preparing the onion. Turn the heat down to stir-fry the bacon and the onion until the onion slightly caramelizes and gets a brownish color in about 15 minutes. Put the ingredients into a bowl and mix it well. 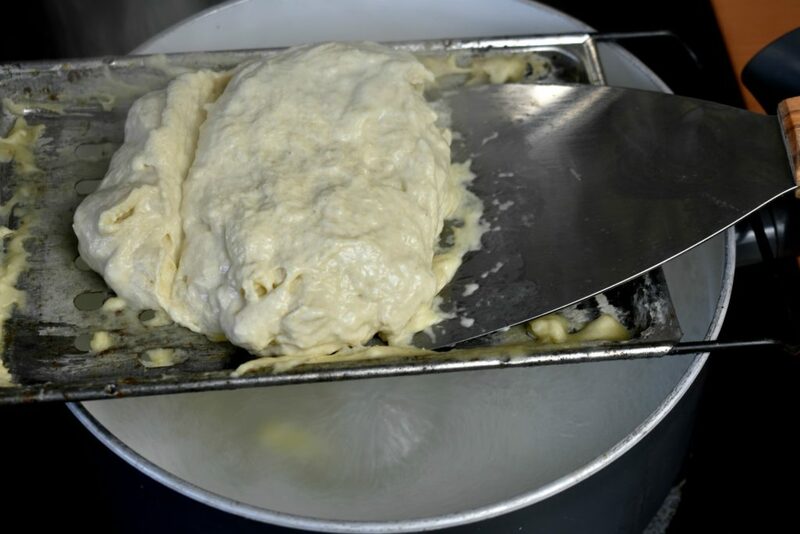 The mixture shouldn’t be runny nor dry to the touch but between that, it’s gonna be good to go. 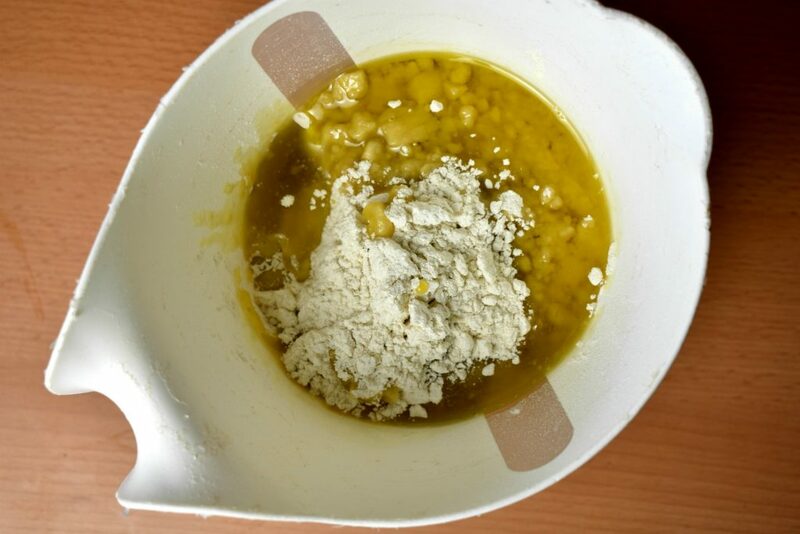 Fill a pot halfway up and add ½ teaspoon/cup or 10g/liter Salt. Put the lid on and bring it to boil. Take the lid off then start making the pasta in batches. The dumplings will submerge upon getting into the water and float back up when cooked in about 30 seconds or less. 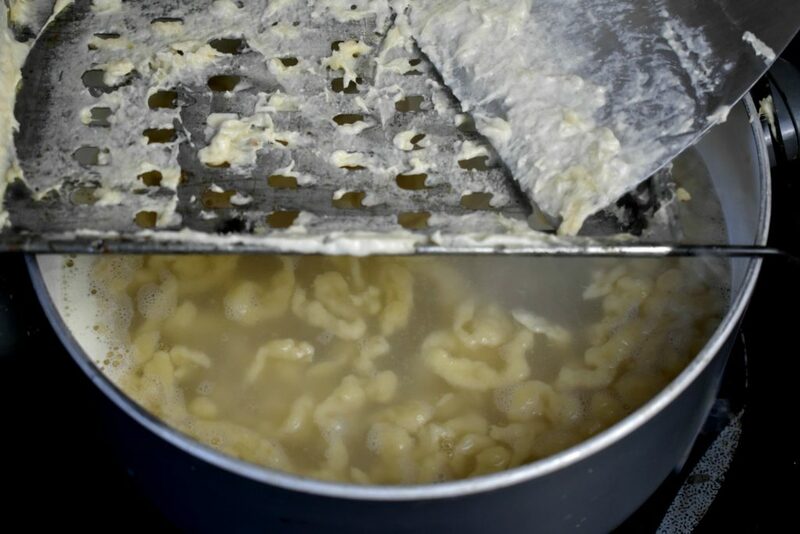 Take the surfaced pasta out from the cooking water and continue with the next batch. 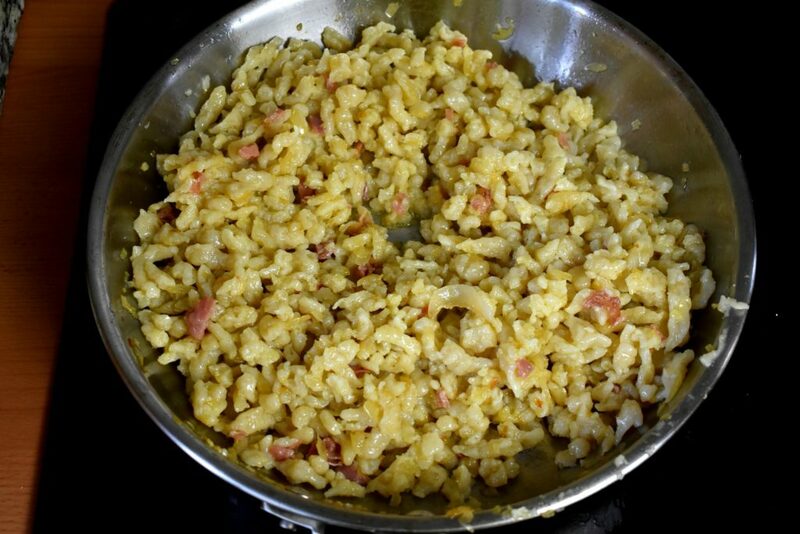 Add the pasta to the onion, bacon, garlic and black pepper in the pan then stir-fry it on medium heat for a couple of minutes until all the ingredients are mixed well and uniformly heated. Crack the eggs and beat them up in a bowl with the grated hard cheese. 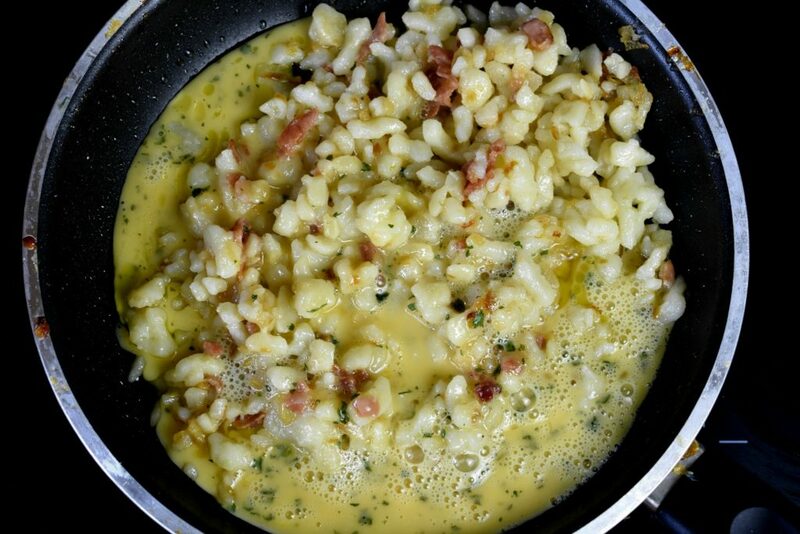 Take the pan off heat and pour the egg right into the pasta while continuously stirring. Mind not to have a too hot pan as that will fry the eggs and we end up having fried egg noodles which is also a fine dish but far from Carbonara. Serve immediately onto plates to avoid clogging of the egg. 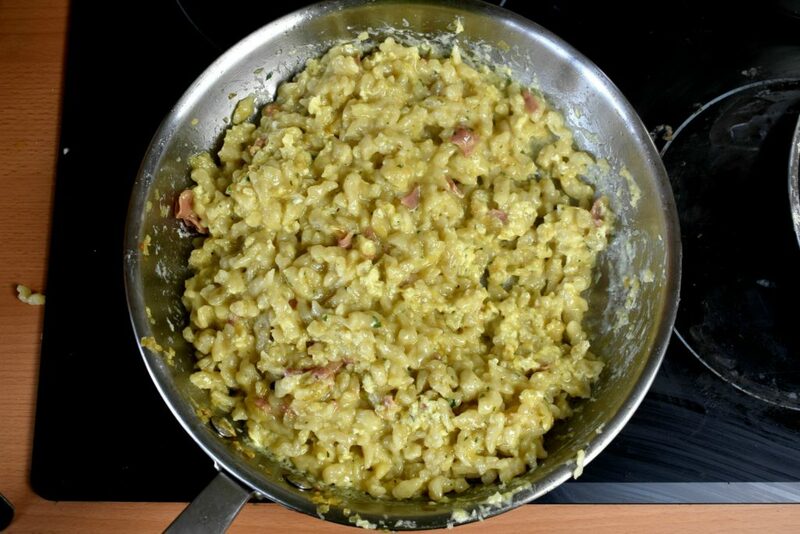 Put the ingredients into a bowl and mix it well.Best-carbonara-recipe-with-traditional-or-gluten-free-pasta-process-2-SunCakeMom The mixture shouldn't be runny nor dry to the touch but between that, it's gonna be good to go. Fill a pot halfway up and add 1/2 teaspoon/cup or 10g/liter Salt. Put the lid on and bring it to boil. Use something with holes on like the opposite side of a shredder with big holes and a spatula or make the dumplings with a small spoon. 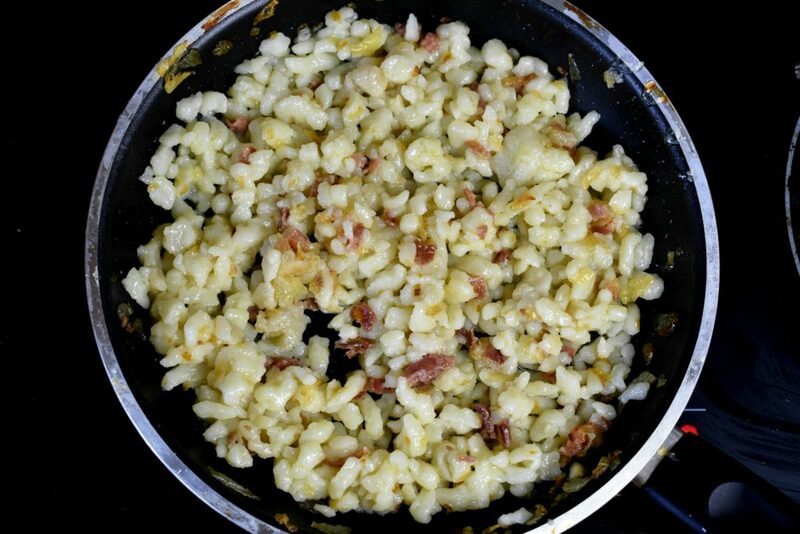 Here we use a special tool called Spaetzle maker. Master of the chef's knife. Tamer of the wild flavors into harmonious perfection. All time blind champion of the roller technique. Get the right tool for the right job! This looks much more easier then I’ve ever thought. Don’t forget that it’s not just easier but tastier too. Fresh is always better! Is it really that easy to make pasta? It is as it’s on the pictures. 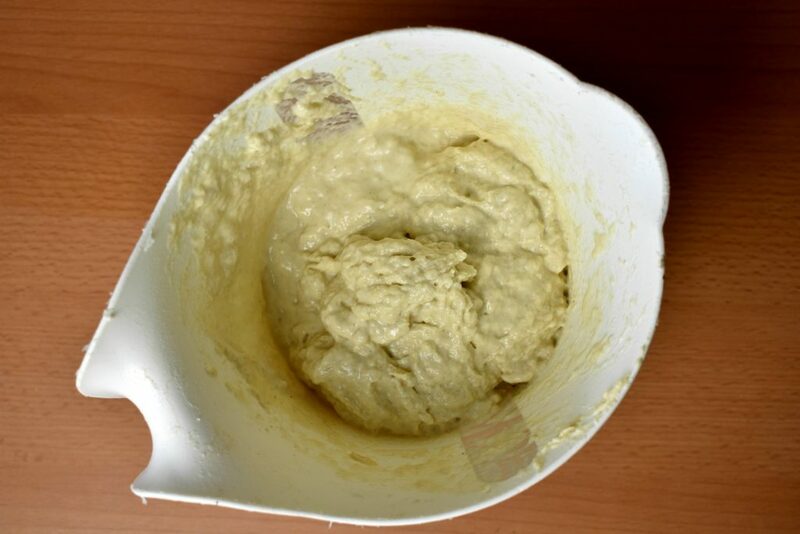 It takes almost no time to whip up even a gluten free pasta given that there is flour or a grinder at hand. Glad to see that the photos are of any help! Thanks a lot!